Aquiris Game Studio was founded in 2007 in a city called Porte Allegre in Brazil. The studio has around 70 employees and they've developed games for the browser, mobile and PC game markets. The company claims to have developed over 20 games including many games for the Cartoon Network. Aquiris developed a free-to-play shooter called Ballistic Overkill (which apparently has over 6 million players) and this was brought to Steam in 2017 as a paid title: it currently holds a "Mixed" rating from Steam users. 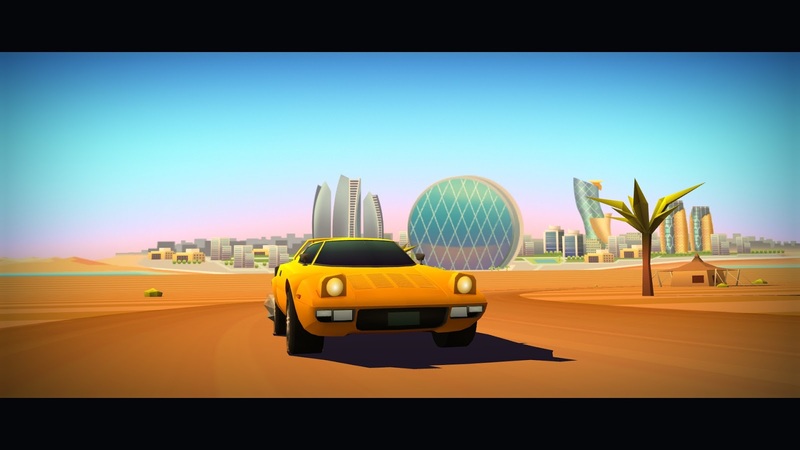 In 2015, Aquiris released the arcade racer Horizon Chase: World Tour on mobile devices; it was very well received even attaining a score of 88 on Metacritic for the iOS version of the game. I was pleased to hear they had plans for a PC release and in May of this year, PC gamers finally got to experience what all the fuss is about. Horizon Chase Turbo is a retro arcade racer and is similar to classic racing games of the 90s such as Out Run, Top Gear, Lotus Challenge and Crazy Cars. These games aren't overly complex: the "Up Arrow" key is to accelerate, the "Down Arrow" key is to brake and the other arrow keys are for turning. The only other control worth noting is the Spacebar which uses nitros and that's all there is to it. The game has 109 tracks you can race on and you'll experience this all on the default mode called World Tour. Doing well in races will reward you with more points that will unlock more races and even cars; each car has different stats such as top speed, acceleration, handling, fuel economy and nitro power. 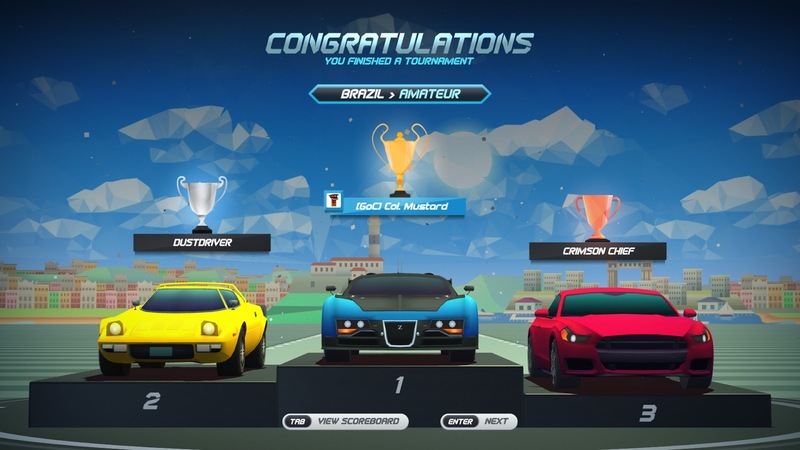 Once you've had enough with World Tour mode there are a couple of other modes called Tournament (where you play 4 races consecutively from a particular cup) and Endurance (where you have to try to survive to the end of multiple races). The game supports local split-screen multiplayer for up to four players. Unlike many of the games I've reviewed, there was quite a lot of anticipation for this one and it wasn't because I was following the developer, but because I was researching about one of my favourite composers: Barry Leitch. In 2015, I posted a "Where are they now?" feature on Leitch which summarised what he had been up to over the past few decades and what he was working on at that time; you can imagine my excitement when I discovered he was still in the business of composing music for games and he was, at that time, working on a little mobile game called Horizon Chase: World Tour. Horizon Chase: World Tour was released on mobiles in 2015 and Leitch was kind enough to also release the soundtrack on Bandcamp the following year, so that even those who weren't experiencing the game could at least experience the music (unlike another composer, I'm looking at you John Broomhall!). I really enjoyed the soundtrack and was keen to try out the game as soon as it was on PC. It took Aquiris another three years before the game finally made its way on Steam as Horizon Chase Turbo and I did not hesitate to grab myself a copy 😊. There are 12 countries/territories and 48 "cities" that you can drive through including the two countries I've lived in for most of my life: U.A.E. and Australia! The horizon for Abu Dhabi wasn't entirely accurate but hey, it's an arcade racer so they can be forgiven 😉. At various points in the race, the driver in your car will offer various quips through speech bubbles. My favourite ones have to be when you're driving the 1970 Dodge Charger though; no prizes for those who can guess where the quote "I don't have friends. I have family" comes from 😉. There are 31 cars you can unlock. 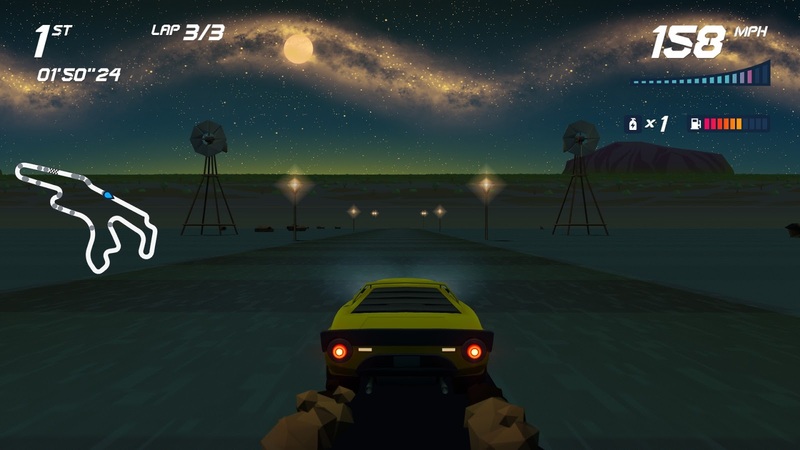 The game's colourful, low-poly graphics really suit the game and some tracks even feature special effects such as fireworks when you race on the Hong Kong track or the Aurora Borealis when driving in Iceland. As I've already confessed, the main reason I even knew of this game's existence was the fact that the great Barry Leitch collaborated with Aquiris on the soundtrack: I think it was one of the best decisions they ever made because the soundtrack complements the game perfectly and it's fun to listen to on its own. Since it's a retro arcade racer game it means it's really easy to pick up but hard to master: while the controls are really simple to learn, figuring out the tracks so you don't end up being awarded the title of "Signpost Kisser" is another matter entirely. Oh, each of those 48 "cities" I mentioned earlier usually have 2 or 3 tracks, giving a grand total of 109 you can race on – so there's plenty of variety. The game has split-screen, local multiplayer for up to four players and is great fun if you can grab some family and friends over to give it a go. I've had no issue playing the game on the Steam Link with one, two and three players using Logitech F710s. I haven't encountered any serious showstopper bugs yet which is pretty rare to see in games nowadays. Once you're finished with World Tour mode the game doesn't end there: you can then try your hand at Tournament and Endurance modes. While you'll be driving on the same tracks again, you will be rewarded with new cars for completing these modes – they're also kind of fun modes to play with friends for local multiplayer. The game has 37 Steam Achievements you can earn, 15 Steam Trading Cards to collect and has Steam Leaderboards so you can compete against your friends and the general public. Uluru, I get. Sydney, I get. But Brighton Beach as Australia's third "city"? C'mon, don't BS me. Look, I really like this game, and I'm finding it hard to find flaws, so I'm really clutching at straws here, but the only potential bugbear I could find is that you can play the original game for free on iOS and Android; if you pay about $4 it will unlock all content (at least that's what I could gather from the store pages). Since, the Steam version is $20 USD, this might seem a bit steep when you compare it to the mobile version, but it does have extra features (some of which I've already mentioned) such as split-screen local multiplayer, integration with Steam Leaderboards, ghost cars as well as Tournament and Endurance modes. There's not much I can fault about this retro arcade racer from Brazil as it seems to do everything right: it has appealing visuals, a garage of iconic cars to unlock, many locations to visit, a top-notch soundtrack by a composer who has plenty of experience scoring for arcade racers, local multiplayer, Steam integration, and, it's just a blast to play. Horizon Chase Turbo is the best arcade racing game I've played in years and I don't regret purchasing it at all. Is the game worth $19.95 USD? : Yes, but only just. There are plenty of indie racing games on the market and while I'd usually be raising an eyebrow if I were to pay $25 AUD for the experience, Horizon Chase Turbo is a quality title and I don't feel I have been short-changed at all, even at full price.